Welcome to Create New Futures. 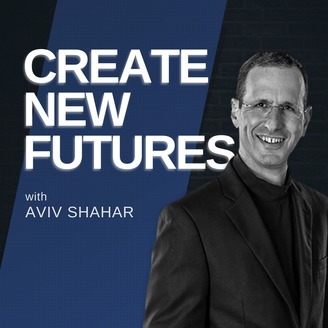 Every episode, best-selling author and host Aviv Shahar will explore ideas and insights that can awaken and inspire you to the opportunities you have to create new futures for you, your family, your teams, and for your business. Life is too short to not be engaged in fascinating conversations that open, inspire and unleash new ways of thinking and seeing possibilities and beauty. Through Create New Futures, Aviv will engage in conversation with leaders and experts to explore practices that you can use to create and shape the future. With his guests, Aviv will put a magnifying glass on strategies and frameworks that he has applied to help senior executives and their teams achieve significant breakthroughs that lead to game changing results. Ideas, strategies, breakthroughs and practices that you can apply. With his innovative ideas and frameworks, Aviv walks you through what you need to lead and transform an organization, and redesign your life to achieve new goals. Together with his guests, Aviv will explore how to develop strategy, how to lead to enable teams to unleash their brilliance and what is the inside work leaders must engage in to develop executive presence and charisma. More than ever, humanity now needs people who are open and prepared to imagine, create, and sustain new futures. This is a time of great transformative and disruptive change. It demands our best imagination, courage, and creativity. 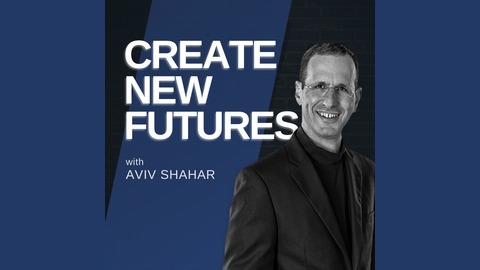 Through this podcast, Aviv will inspire you to be tomorrow's agent by creating conversations that birth new possibilities for you and for the people in your life. Through his concept of Architecture Thinking™, Aviv walks you through what is needed to lead change, transform an organization, redesign your life to achieve new goals, serve new needs and realize new possibilities. Leaders need to consider how to bring about and enable a compound set of outcomes by concurrently integrating multiple inputs. In this very special episode, Aviv switches roles and becomes the interviewee as Bill Fox asks poignant questions on leadership, vision, and innovation. Aviv lists the seven evolutionary developmental blockages that we as a society have overcome. He talks about the importance of conversation and the impact they can ultimately have on creating new and exciting futures. Finally, Aviv urges the audience to appreciate how precious life is and challenges them to seize every opportunity life has to offer. 07:04 – Aviv answers Bill’s first question: How can we create work places where every voice matters, everyone thrives and finds meaning, and change and innovation happen naturally? 18:47 – Aviv answers Bill’s second question: What does it take to get an employee’s full attention and best performance? 20:59 – Aviv answers Bill’s third question: What do people really lack and long for at work? 25:25 – Aviv answers Bill’s fourth question: What do you think is the most important question leadership or management should be asking their employees or followers? 26:20 – Aviv answers Bill’s fifth question: What is the most important question employees should be asking back to leadership and management? 27:03 – Aviv answers Bill’s sixth question: What is the most important question we should be asking ourselves?